Everything? Really? Because there are some things that I want that have absolutely nothing to do with being afraid. For example, I would like the laundry to magically wash, dry, fold and put itself away without ANY effort on my part. Laundry is exhausting! And it’s NEVER done. I have no fear of laundry, unless of course, I haven’t been able to get to it in over a week and I know that the mountain of clothes gathered in the laundry room will be damn near insurmountable! I realize that I have taken the quote out of context but I do it to show how silly some of the quotes we take to heart and use to guide our lives can be. Is the quote important, sure. Should it be a guidepost for some of the struggles we face in our lives, sure. Does it apply to every aspect of our lives, no. My point in all of this is that there has to be some line, some balance, some critical thought so that we can apply this wisdom to our lives in a way that makes sense and is actionable. I see a lot of quotes pinned on Pinterest. I am guilty of pinning a number of quotes that I read and think “Wow, so true!” and then never really think about again. I am almost positive the majority of chronic quote pinners are guilty of the same. But, back to fear. I thought I’d try to take this quote and make it actionable by applying it to some of the concrete life decisions I am faced with over the coming months. One is applying for a position at my job that requires me to speak in front of a room full of strangers. I HATE public speaking and I am sure that places me squarely on the bell curve of the majority of people reading this. I am no outlier when it comes to speaking in front of people I don’t know. I’d rather not. But the fact is, I have a dream I’d like to see come true (a higher paying job with unlimited potential), and speaking in front of strangers is a stepping stone toward that dream. I’m scared shitless to be honest. But I did it. I applied to the position because in this case, something I want (not everything because my laundry still lies waiting for ME in the laundry room) IS on the other side of fear. And in all honesty, if I let fear continue to guide the decisions I make, well, I’m fucked. 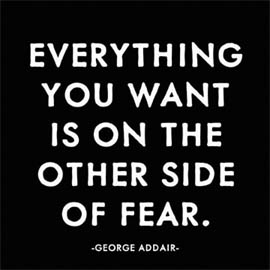 You can only move forward if you push through your fear. Words of wisdom made actionable. That’s how life changes.